Background: Cardiac complications are the primary cause of death in patients with b thalassemia major. QTc interval is an indicator of variability of ventricular repolarization and is supposed to be prominent in high risk patients. The aim of this investigation was to evaluate the relationship between QTc interval in β thalassemia major in comparison with the control group. Patients and Methods: Sixty β thalassemia major and intermadia patients were enrolled in this analytical cross-sectional study. Thalassemia major and intermadia patients with no clinical symptoms of cardiac disease underwent echocardiographic and stress tests. QTc interval, blood pressure, heart rate, and average serum ferritin levels were measured. Statistical analysis was performed using version 15 SPSS. Results: Although there was no clinical or echocardiographic sign of cardiac disease and QTc intervals measured before the test were not significantly different between patients and control group (421.7 ± 29.6 vs. 412.4 ± 28.2, P = 0.06), we found that, during stress test, QTc intervals (452.7 ± 30.8 vs. 410.2 ± 26.2, P < 0.001) and heart rate (105 ± 15.1 vs. 89.7 ± 12.3, P < 0.001) were notably greater in β thalassemia major patients compared to the control group, respectively. Conclusion: We found augmented QTc intervals in this group of thalassemia major patients who have neither clinical nor electrocardiographic and gross echocardiographic signs of cardiac disease. QTc interval can be helpful in the cardiac assessment of thalassemia major patients. In this study, we sought to evaluate QT distribution and the relation between QT dispersion and body iron overload among patients with β-thalassemia major. In this cross-sectional study, 60 patients with thalassemia major and thalassemia intermedia, who had been diagnosed since childhood, were enrolled. All these patients had received transfusions frequently and had referred to Firouzgar center for cardiologic follow-up every 6-12 months. Participants were older than 15 years and had no previously evident cardiac disorder. Control group was assigned simply and non-randomly from medical students that were 19-28 years old and did not have any past medical history. Demographic/clinical data and informed written consent were obtained from all of the patients. Ferritin plasma level of patients was also obtained from outpatient clinics. This study was conducted with the approval of our Institution Review Board (IRB). Echocardiography was performed for all of the patients. In the next step, patients with unremarkable echocardiography underwent Bruce exercise tolerance­ test. Bruce method consists of four stages with increasing velocity and in every stage, QT intervals are measured and recorded in electrocardiography papers during the test. In addition, blood pressure and heart rate are measured and recorded during every stage of the test. All data were presented as the mean ± SD. Statistical analyses were performed by SPSS statistical software (version 16.0 for Windows; SPSS Inc, Chicago, IL, U.S.A). Chi-square and independent sample T- tests were used to compare qualitative and quantitative variables respectively. P values less than 0.05 were considered statistically significant and 95% confidence intervals were reported. Sixty β thalassemia major and/or intermadia patients (40 thalassemia major and 20 intermadia) including 32 males and 28 females and 62 healthy controls (30 males and 32 females) were enrolled in this cross-sectional study. The demographic and hemodynamic characteristics of patients are presented in [Table 1]. There were no significant differences in age and gender between groups. Mean age of b thalassemia and control groups were 25.4 ± 5.9 (ranged 15 to 41) and 25.7 ± 3.1 years old (ranged 20 to 35), respectively. The serum ferritin mean ± SD level was 2396 ± 2058 g/L. Additionally, there were no significant differences in serum creatinine and hemoglobin level between both groups. Electrocardiographic (EKG) and standard echocardiographic findings were normal and all patients were in sinus rhythm. Also, they did not show any electrocardiographic evidence of cardiac failure or arrhythmia. The systolic and diastolic blood pressure values were remarkably lower in β thalassemia group (P = 0.001), while the heart rate was higher in β thalassemia compared with control group (105.1 ± 15.1 vs. 89.7 ± 12.3, P = 0.001). As shown in [Table 2], measurement of corrected QT (QTc) interval values before and during exercise test revealed that resting QTc interval was slightly longer in β thalassemia group compared with the control with no statistical significance (422.3 ± 30.2 vs. 413.6 ± 23.1, P = 0.08). 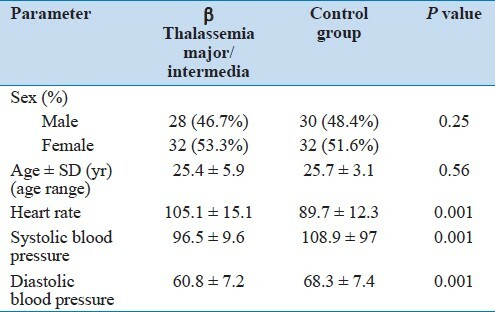 But QTc interval during exercise became prolonged in β thalassemia patients that were considerably higher compared with control group [Table 2]. We compared effect of serum ferritin levels >1000 g/L and <1000 g/L on QTc interval among β thalassemia patients in which the results showed no significant difference between groups (P > 0.05). Similar to our findings, Ulger et al. detected that although there were no clinical or echocardiographic signs of cardiac disease, QTc intervals were superior in β thalassemia major patients compared to the control group. In our study, the resting QTc interval was slightly higher in β thalassemia patients compared with the healthy controls with no statistical difference. Previous studies have reported that serum ferritin level less than 2500 ng/dL is associated with better cardiovascular prognosis. Moreover, serum ferritin less than 1000 ng/dL is associated with normal left ventricular ejection fraction (LVEF). Here in, the mean serum ferittin in β thalassemia major and intermedia patients was 2806 and 2004, respectively. Thirty percent patients had serum ferritin upper than 2500 ng/dl, which indicates that compliance to chelation therapy was not uniform within the study group. This may also explain the absence of heart failure and significant valve diseases in the current study population. The QT interval is a measure of identifying ventricular depolarization and repolarization. The prolongation of QT interval predicts increased risk of life threatening ventricular arrhythmias and sudden death. Ulger and colleagues revealed that left ventricular myocardial infarction e(LVMI) was higher in thalassaemia major patients compared to the control group and there was a positive association between LVMI and QTc dispersion. In this study, we detected that although there was no clinical or echocardiographic signs of cardiac disease, QTc interval and QTc dispersion were higher in β thalassaemia major patients compared to the control group. QTc dispersion can be used in the cardiac assessment of thalassemia major patients. It has high reproducibility as a non-massive tool. Prospective studies are considered necessary to elucidate the relationship between the prolongation of QTc dispersion and consequent cardiac events in thalassemia patients. 1. Zurlo MG, De Stephano P, Borgna-Pignatti C. Survival and causes of death in major thalassemia. Lancet 1989;ii:27-30. 2. Olivieri NF, Nathan DG, MacMillan JH, Wayne AS, Liu PP, McGee A, et al. Survival in medically treated patients with homozygous β-thalassemia. N Engl J Med 1994;331:574-8. 3. Borgna-Pignatti C, Rugolotto S, De Stefano P, Zhao H, Cappellini MD, Del Vecchio GC, et al. Survival and complications in patients with thalassemia major treated with transfusion and deferoxamine. Haematologica 2004;89:1187-93. 4. Atiga WL, Calkins H, Lawrence JH, Tomaselli GF, Smith JM, Berger RD. Beat-to-beat repolarization lability identifies patients at risk for sudden cardiac death. J Cardiovasc Electrophysiol 1998;9:899-908. 5. Wei K, Dorian P, Newman D, Langer A. Association between QT dispersion and autonomic dysfunction in patients with diabetes mellitus. J Am Coll Cardiol 1995;26:859-63. 6. Barr CS, Naas A, Freeman M, Lang CC, Struthers AD. QT dispersion and sudden unexpected death in chronic heart failure. Lancet 1994;343:327-9. 7. Olivieri NF, Brittenham GM. Iron-chelating therapy and the treatment of thalassemia. Blood 1997;89:739-61. 8. Piccirillo G, Magrì D, Matera S, Magnanti M, Torrini A, Pasquazzi E, et al. QT variability strongly predicts sudden cardiac death in asymptomatic subjects with mild or moderate left ventricular dysfunction: A prospective study. Eur Heart J 2007;28:1344-50. 9. Magrý D, Sciomer S, Fedele F. Increased QT variability in young asymptomatic patients with β thalassemia major. Eur J Haematol 2007;79:322-9. 10. Tomaselli GF, Zipes DP. What causes sudden death in heart failure? Circ Res 2004;95:754-63. 11. Ulger Z, Aydinok Y, Levent E, Gurses D, Ozyurek AR. Evaluation of QT dispersion in β-thalassemia major patients. Am J Hematol 2006;81:901-6. 12. Aessopos A, Farmakis D, Hatziliami A, Fragodimitri C, Karabatsos F, Joussef J, et al. Cardiac status in well-treated patients with thalassemia major. Eur J Haematol 2004;73:359-66. 13. Borgna-Pignatti C, Rugolotto S, Stefano PD, Zhao H, Domenica, et al. Survival and complications in patients with thalassemia major treated with transfusion and deferoxamine. Haematologica 2004; 89:1187-93. 14. Haverkamp W, Breithardt G, Camm AJ, Janse MJ, Rosen MR, Antzelevitch C, et al. Report on a policy conference of European society of cardiology. The potential for QT prorogation and proarrhythmia by non-antiarrhythmic drugs: Clinical and regulatory implications. Eur Heart J 2000;21:1216. 15. Anderson LJ, Holden S, Davis B, Prescott E, Charrier CC, Bunce NH, et al. Cardiovascular T2-star (T2*) magnetic resonance for the early diagnosis of myocardial iron overload. Eur Heart J 2001;22:2171-9. 16. Garadah TS, Kassab S, Mahdi N, Abu-Taleb A, Jamsheer A. QTc Interval and QT Dispersion in Patients with Thalassemia Major: Electrocardiographic (EKG) and Echocardiographic Evaluation. Clin Med Insights Cardiol 2010;4:31-7.